This delightful town offers safe bathing, a traditional Victorian pier, coastal walks and one of the best sunshine records in England. A traditional little road train will take you all along the seafront and into the town centre, which is lively and fun, with shops, cafes, bars and restaurants. This island has a magic all of its own - and is one of the UK's sunniest and warmest places. 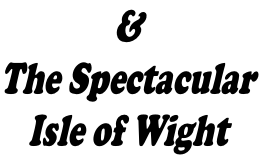 The Isle of Wight is approximately 23 miles East to West, and 13 miles North to South. The Island's geographic profile has been formed over many thousands of years, by the water of the English Channel. From the rocky cliffs of The Needles on the West Coast, over to the sandy beaches of Sandown and Shanklin on the East, no other UK holiday resort offers so much beauty & history. Osborne House the countryside retreat of Queen Victoria for over fifty years until her death here in 1901. In this palace she and her family could be free from state ceremonial. Visitors walk through the private rooms, including the sitting room in which Queen Victoria and Prince Albert worked side by side, the Royal Nursery and even the royal bathrooms. The dining room is shown being laid for a family dinner and the visitors can take a peek below stairs to see where the household made final preparations for the royal meals. The Durbar Room is considered by many to be the most stunning of the state rooms. “Mrs Brown” was filmed here. Like the house, the gardens at Osborne were in formal Italianate style and were designed by Thomas Cubbit. The walled garden produced flowers and fruits for the house. The Swiss Cottage was built for the royal children and contains furniture especially crafted for them.